Fylde stormed into the National League play-off places with this convincing victory. Goals by Andy Bond, Danny Rowe and Jordan Tunnicliffe lifted the Coasters three places to sixth and made it 19 points out of a possible 21. The evening began with a minute's applause for Fylde coast football great Jimmy Armfield. Manager Dave Challinor named the same side that put six past league leaders Macclesfield Town on Saturday and they soon threatened as Rowe sidefooted wide from a Zaine Francis-Angol cross. Fylde took the lead on 13 minutes, when Sam Finley looped a cross into the penalty area and Bond steered a half-volley into the bottom corner for his second goal in as many games. Top scorer Rowe was surprisingly not among the scorers against Macc but almost put that right with a cushioned strike which rebounded off a post. The Coasters were really upping the ante and keeper Lee Worgan had to react quickly to keep out Jack Muldoon’s back-post header. A tame Reece Prestedge free-kick, easily claimed by Jay Lynch, was the best the lacklustre visitors could muster in the first half. The Coasters were forced into a change shortly before the interval when winger Jonny Smith was replaced by Serhat Tasdemir. A deserved second goal arrived on the stroke of half-time. Muldoon cut the ball back from the bye-line for Rowe to scuff a shot in off a defender and a post for his 16th of the league campaign. Maidstone almost got back into the game early in the second half, when Delano Sam-Yorke nipped in between the defenders only for Lynch to make a brilliant point-blank save. Darius Osei fired narrowly over in the melee that ensued. 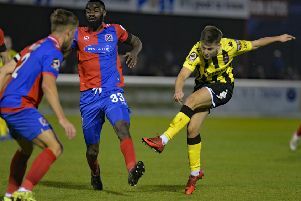 Striker Sam-Yorke tested Lynch again with a fizzing 20-yard effort as Fylde struggled to rediscover their fluency, though Tasdemir was inches away from Rowe's cross and then set up Lewis Montrose to shoot over. Fylde should have wrapped up the points 15 minutes from time, when Tasdemir headed Finley's cross into the path of the onrushing Muldoon, who sliced his shot a foot wide. Hot prospect Tasdemir then went close to a memorable solo goal as he cut in from the left and saw his awkward shot bobble in front of Worgan only to drift wide. The points were sealed six minutes from time, when Tunnicliffe volleyed Finley's corner through a crowd of players and past the unsighted Worgan. AFC Fylde: Lynch, Burke, Tunnicliffe, Stubbs, Francis-Angol, Montrose, Bond, Finley, Muldoon (Chettle 81), Smith (Tasdemir 41), Rowe (Blinkhorn 88). Subs not used: Grand, Taylor. Maidstone: Worgan, Prestedge (Reason 76), Wynter, Okuonghae, Lewis, Sam-Yorke, Paxman (Muldoon 71), Anderson, Twumasi, Osei, Ter Horst (Richards 71). Subs not used: Hare, Healey.